Do you think that you can make a career in the Retail Industry but need more information about positions available for you in this Sector? JobTestPrep is here to fill in gaps in your knowledge about the Retail Industry and prepare you for your upcoming tests and interviews. 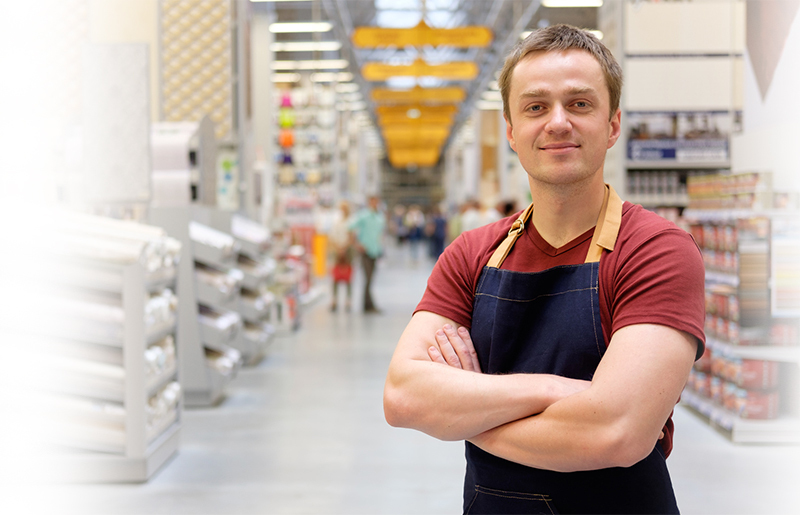 On this page, we furnish reliable information about working in retail and explain what qualities you should have to excel in your retail job. Here you can also find a list of retail positions for which you can apply, if you decide to work in a store or warehouse. Apart from supplying detailed information, we also help practically: we have brought together in one PrepPack™ accurate test simulations, interview resources, and study guides. These materials will lead you to a successful completion of your application process. Equip yourself with our helping, high-quality resources and start delivering excellent service to customers in the Retail Industry. The Retail Industry is rather an umbrella concept, including all businesses that sell goods and services to customers. Among these businesses are department stores, specialty stores, discount stores, and seasonal retailers, all of which sell their products to consumers. But there are common principles by which all different retailers operate. Retail, a word that etymologically comes from the Old French word “tailler” meaning “to cut off and pare,” is reselling. A retailer is an organization or a person who sells products or services directly to consumers and end-users, that is, to people who would use the offered products. It is often agreed that at least 80 percent of sales activity must be directed at customers using goods that retailers sell. Selling activities are organized in retail stores, though some products are sold through vending machines, door-to-door sales, or on internet. How Is the Retail Industry Divided? The Retail Sector can be divided in different ways. The simplest way is to differentiate between products that are sold by companies. According to the type of the sold products, the Retail Industry can be “hard” and “soft.” The “hard” segment of the retail sells electronics, furniture, sporting gears, and various appliances. Businesses specializing in these goods are called “hardline retailers.” The “soft” section of the Retail Industry offers clothing, different apparels, and other fabrics. Demographic – The strategy of these retailers is to target representatives of a particular social group. For example, they may offer goods and services attractive only to rich customers. These strategies bring different results depending on economic circumstances in which a country or the world in general find themselves. In hard economic times, when people are trying to spend less, discount shops do better than other stores. When economy blossoms, more expensive stores rise above their competitors. To succeed equally well in tough and thriving economic times, many retailers attempt to combine different marketing strategies. What Are the Types of the Retailers? Department Stores – This type of stores sells a wide array of products arranged into different categories and displayed in separate sections of the building. Among departments that you can find in such stores are housewares, pottery, clothing, shoes, beauty products, lingerie, and jewelry. In the UK, the most famous department stores are Marks & Spenser, Debenhams, Harvey Nichols, House of Fraser, and John Lewis. Supermarkets and Grocery Stores – These stores sell different types of food and beverages. Oftentimes, there are also clothing, home products, and consumer electronics departments in supermarkets and grocery stores. The popular supermarkets in the United Kingdom are Tesco, Sainsbury’s, ASDA, Morrisons, Waitrose, and Iceland. Warehouse Retailers – These are unadorned facilities similar to warehouses, where products are sold in bulks and at prices that are lower than in supermarkets and department stores. Among warehouses retailers in the United Kingdom are Costco, Morrisons Distribution Centre, Tesco Distribution Centre, and Constellation. Specialty Retailers – This type of retailers focuses on a specific category of products, such as sportwear, lingerie, toys, books, and jewelry, among others. Several examples of specialty retailers in the United Kingdom are Waterstones that sells books, Lush specializing in cosmetics, Hallmark selling gifts and cards, Pandora where people buy jewelry, HMV that offers music records, Sports Direct trading in sportwear and sport gear, and Early Learning Center that is in toys and games business. Convenience Retailer – This kind of stores sells gasoline primarily at gas stations along with some groceries, sweets, and auto care products at a so-called convenience price. There are numerous convenience stores across the UK, among which are Best-One, Co-op Food, Jones Convenience Store, Londis, McColl’s, Nisa, Sainsbury’s Local, Shop’N Drive, and Tesco Express. Discount Retailer – These shops sell a wide range of products at low costs, much below prices offered at other stores. Often, these shops sell closeout or discontinued goods cheaper than they have originally been sold. Among numerous discount stores in the United Kingdom are these: Bargain, Buys, Max 99p, Poundland, Woolworth, the Range, and In-Excess UK. Mobile Retailer – This is the fastest-growing retail sector, responsible for more than 30 percent of online sales in the world. In this type of retail, goods are purchased by customers using smartphones, tablets, and other mobile devices allowing them to brows retail offers and pay for goods at any time of day or night. In the UK, as in other European countries, mobile retail has recently grown from £133.30 billions to £184.74 billion and is expected to grow by whooping 190% this year. The proportion of mobile sales in the United Kingdom now is high, reaching 27%. Internet Retailer – This kind of retailer sells from an Internet shopping website and ships the purchases to customers directly to their homes or workplaces. On internet, goods are also usually sold at lower prices than in other shops. What Are the Job Opportunities in the Retail Sector? This position does not require formal education. Many employers do not even expect job candidates to have work experience. After you have submitted your application online, you will be provided training in a store, if you are hired. You can work as a cashier almost in any type of the stores described in the previous section above. Department stores, supermarkets, warehouses, specialty stores, convenience stores, and discount shops need cashiers to make payment transactions. Many cashiers work part-time. Average cashier salaries in the UK are £17,940 per year. Although all calculations are done automatically on a till, cashiers still need to have strong numerical skills to avoid relying on the till’s calculator. They also need to know basic arithmetic to count money correctly at the end of the working day. Because cashiers often write reports and order goods, they need to have good reading comprehension and writing skills. There is a wide variety of customer service job opportunities in every store, each of which includes a different set of duties. If the Customer Service Representatives work at the customer service desk, they take care of people’s returns and make transactions. They also provide exhaustive information to customers about products, prices, and discounts. They also tell them about the availability of the goods they want to purchase and answer their questions about delivery. Excellent communication skills are a must in this profession, since Customer Service Representatives solve customers’ problems and have to be understood and deliver information clearly and politely. The average annual pay for a Customer Service Representative is £17,499. The Department Manager of the store is responsible for one section in it. In the Department Store, where a large variety of items are sold, from clothes, shoes, jewelry, cosmetics to china, cutlery, sport gear, and electronics, the Department Manager can be responsible for one of the section selling these goods. Responsibilities of the Department Manager include selling goods, making orders of required items, taking stock of sold goods, reporting sales to the Head Office, taking care of damages, and maintaining discipline in the department. Depending on the store, the Department Manager may also take charge of the recruitment process. The Department Manager should have good organizational skills, excellent problem-solving skills, and should possess general intelligence to manage the department. Good communication skills are also indispensable for this role. On average, Department Managers earn £29,000 per year, though in some companies their salaries may be as high as £37,500 per year. The person employed as a Logistic Coordinator is responsible for bringing products to stores. The Logistic Coordinators keep track of inventory and order stocks, being thus constantly in touch with companies’ head offices and warehouses. They also manage the organization of stock rooms and make sure shipping of goods and their delivery are performed on time. The Logistic Coordinators should be well-organized, disciplined, and attentive to details. They need to calculate well and have good logical thinking. Logistic Coordinators must always acquire new skills. Thus, good knowledge of Export Compliance usually opens for them the door to new career opportunities and promotion. The average annual salary of the Logistic Coordinator in the United Kingdom is £21,085. JobTestPrep does everything in its power to help job applicants to secure for themselves a place in the Retail Industry. To this end, we design accurate test simulations of those tests that job candidates are likely to encounter during their pre-employment assessment in their chosen retail company. Desirous to help applicants also during their face-to-face interviews, we have added to our top-notch PrepPack™ interview materials containing tips on how to behave impressively, when talking to recruiters. Purchase our exclusive practice materials and start serving consumers in the Retail Industry.